I kept it very simple! I sponged the card base with red ink and colored the cutie with Copic markers. She really pops against the background! It’s a perfect one-layer card! 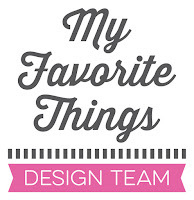 Be sure to check out the MFT blog to see what my amazing teamies made with all the fantastic new products! And don't forget to comment to win one of two $100 gift vouchers! Your coloring is amazing. Love how pretty this card is. Love how you sponged the background--adorable card! Very cute card, love your background and your coloring. This is a great release. I agree that the card is simple and perfect. I do think that sponging that ombre effect requires a little more talent than I have. Thanks for sharing. Fantastic one layer card! I struggle with one layer cards, your's is great! Love how you sponged the background and the image is so sweet! your coloring is amazing and the background helps it look even more beautiful, awesome card. Stunning! Love her in red! 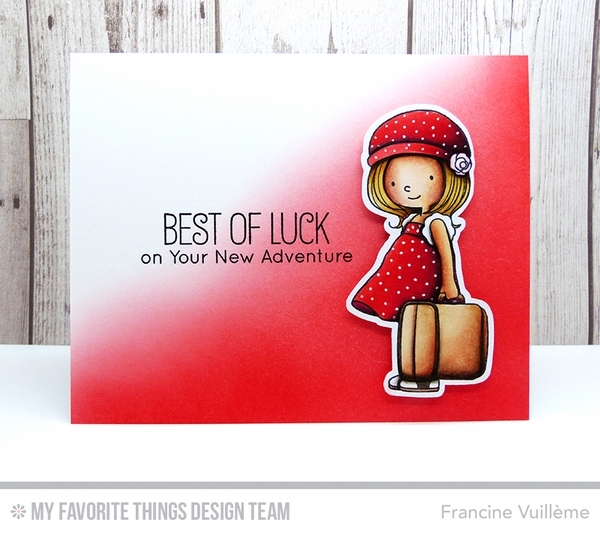 Beautiful card, Francine! I love that blended ink effect! holy smokes that background is stunning! Wow!! Love the red! This is an adorable stamp/die! Love your background! I need to try that! I already ordered a couple of things but feel stupid now...one of the things I wanted could not find in the store. Then it hit me...it was right in front of my face. I made a wish list for next time. Gorgeous card! The sponged background looks amazing! This is super adorable! I love the red. I really love your sponging to draw the eye to this cutie Francine. Another brilliant card of course! Stunning look on this card! She really does pop against the beautiful sponged red background. Just gorgeous! Love the idea of the background, this is super sweet and pops the adorable BB perfectly. Love the color application - awesome! This card is just stunning! Love the coloring and the polka dots on her outfit. Amazing job. Talk about painting the town red - THIS CARD IS AMAZINGLY DONE AND STUNNING!!! You do these amazing things on your cards and it seems so effortless for you!! So very impressive!! Hugs to you!! Beautiful! You created a perfectly sponged background!! Wow! That's beautiful! I love the background. So simple yet says it all! Stunning card. I love the fabulous gradient on your background. Your colouring of the sweet Birdie Brown girl is amazing. Such a darling card!! Beautiful background and awesome job on the coloring! new follower. Love the ombre effect on your card!! Love the red how cute! Oh Francine, your card is amazing. I love this! That's a gorgeous card. I love all of the red, but she doesn't get lost in it, she pops right off due to your fabulous coloring. Love love love the colors of your card! She is my favorite of the new MFT release! Gorgeous card. Love the sponged background. I'll have to try that. A perfect way to display the girl! Very nicely colored. WOW! Your coloring is amazing! I love that background!!! The shaded background and perfect coloring make this card absolutely FABULOUS!! What a beautiful card. The little girl's sooo cute and I love how you did the background! Can't wait to give this card a try. I absolutely love this card, especially the background! Love how you did the background. Gorgeous card! Beautiful ombre that really shows off the little traveler. Beautiful card! Red is one of my favorite colors - I love the background. Thank you for sharing! This IS a perfect one layer card! That background technique is sooo simple, but sooo eye-catching. And your coloring is fabulous; love those little polka dots. Wow ... stunning background! Love it! Awesome card, i love it. Simply Stunning! I love this stamp set! Love the coloring of the background and of the little girl. the bright red really pops. thanks faor sharing a great card. Lovee your shading! Nice card!! Awww, now she is too cute, I love that she is all packed and ready for adventure! I love your coloring, Francine. That sponging work is flawless. I thought it was airbrushed at first. Beautiful! Your gradient pattern sure makes Birdie pop! Love the red. I like the sponged background! Love how you sponged the background. I love how you sponged the background. I will try that technique. Oh this is so sweet! Absolutely precious image. I am so bad at one layer cards. This one is a lesson in stunning!! This is as cut as can be, lovely colouring. Your shading is AMAZING! I love, love, love the RED! This little girl is so cute and you just made her come to LIFE! Love this card. Can't find my comment. Love your beautiful card. Especially the reds. Your sponging is flawless...love the way the image pops. She is so adorable on the red background. This cutie is all dressed up and ready to go. Very sweet card! ahhh!!!! I LOVE this card! Seriously LOVE it!!!! Wonderful coloring and such a sweet card, too! Love it! The color gradient is amazing! Such a beautiful card! Awesome card! Love it! Color is NICE!! Your card is so sweet. Love it. Thanks for sharing. Awesome coloring. I love this stamp. Well done. So cute. Your sponging is amazing. Awesome coloring!! Love the red to white background!! Wow! What a pretty and adorable card! Love it! Ooohhhhh....LOVE, LOVE, LOVE the background!! Fantastic coloring job. Red is one of my favorite colors. Oh she is so super cute, cannot wait to get mine. And it's even more fabulous in red. Wow, this card has so much dimension I can't believe it's only one-layer!! And that background...WOW!! She is so sweet and you made such a lovely little card! The colors on this card are so vibrant! It really pops! Love it. Love the red sotted swiss dress and matching hat. Love this background, Francine! It really does make this cute little girl pop. Love your copic coloring too! Thanks, Paulette S.
A very charming card. The bright red is so pretty and the dots on her dress is a great touch.